Check out these battery deals, just in time for the holidays! 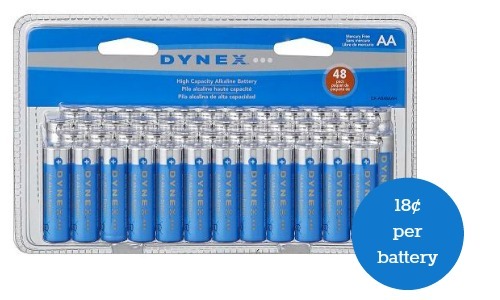 For a limited time, Best Buy is offering the Dynex AAA Batteries for $8.99 (regularly $13.99-$19.99). That’s 18¢ per battery. You can also get a deal on the Rayovac AAA Batteries 48-Count Pack for $9.99 if you’re headed to the store, regularly $19.99. Keep in mind, they are offering FREE Shipping on all order, no minimum purchase required through 12/24!